Oh life, how it takes so many turns! As I mentioned in my first post of the new year; during this time of unemployment/transition, my local Bikram yoga studio hired me for the front desk, while I'm still hunting. This helped me get to class more often, get to know my fellow neighborhood yogis, and free classes all made it well worth it! I have gushed about this practice enough, but it has absolutely changed my life. I had been focusing on a positive mental attitude, especially with sharing so many positive experiences and projects on this blog - but this practice has brought me to an even deeper level of understanding myself. So much so, that after only 2 month of working at the studio, I was (finally) offered a great full-time position in my field! The Power of Positive Thinking is AMAZING! Farmigo is an online farmers' market that connects consumers, workplaces, schools, and community centers directly to local farmers. Founded in 2009, it was originally conceived as a cloud-based software system for farms to manage their CSA subscriptions. In December 2012, they launched Farmigo food communities using existing customers, which leveraged their existing relationships to accelerate the adoption of an "virtual food co-op", beyond the 1% participating in current CSA's. It sounded like Saturday morning Farmers' Market meets Fresh Direct to me! Not only was I interested in using this online service for our own home, I was happy to be a cheerleader for a new way to bring my neighborhood together - getting the best food to our families and loved ones. I put the above posters up all over the studio, created the Instagram image (top of the post), to advertise on social media, and talked the service up to as many yogis as I could. I was the point of contact for all local orders, present at delivery, and made sure members received their orders happily! Once a week, participants filled their shopping carts before midnight on Sunday, and Wednesday afternoon everything was dropped off to the studio - one of Farmigo's many community drop spots in Brooklyn and San Francisco. To celebrate the first delivery, Farmigo sent along a sample of some of their best sellers! We put them out for our members to spread the word. Who wouldn't want a farm fresh organic apple after a Bikram yoga class?!? We made our goal of signing up 10 people, and launched our Bay Ridge drop spot with success! Now that I accepted a full time position, I remain a part time front desk staff employee at the studio, but could not remain as the Community Organizer. I was proud to launch such a cool initiative in my Bay Ridge community, and make sure the kick off was a success! 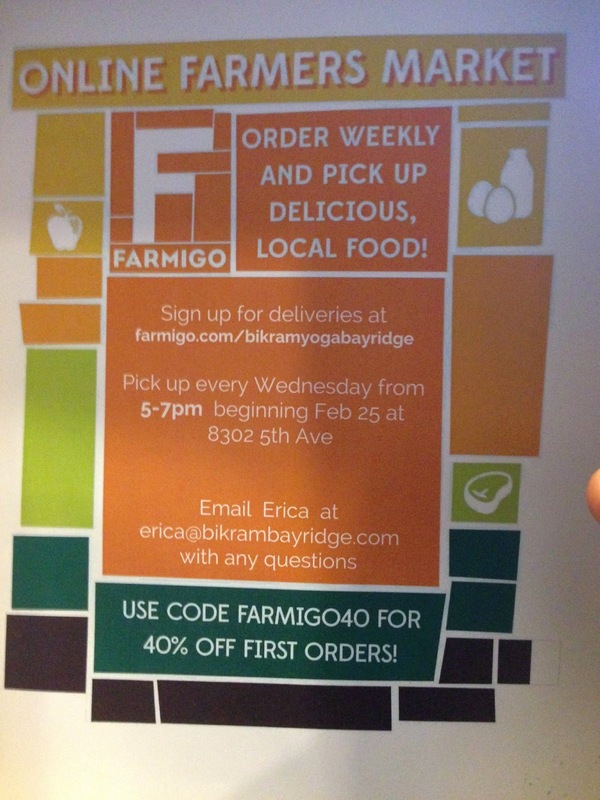 I used my last week in my role to push one of Farmigo's promo codes on my Instagram account. I have been playing with the Over app, and put together a cute walnut reminder for our members! 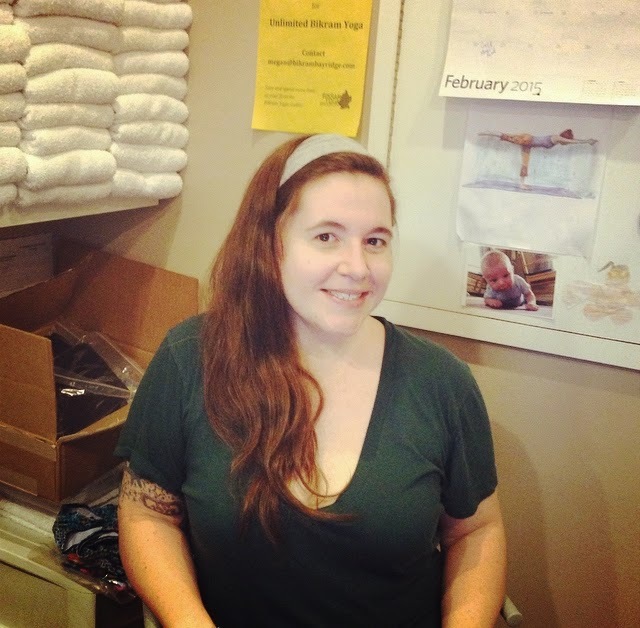 My local and small business experiences has been such a positive one in the beginning of 2015! It has prepared me for the role I am embarking on, and will take that knowledge with me! I encourage everyone to look into alternative ways to get your food, and really think about where your vegetables are coming from. Supporting your local farms in any way you can is a great place to start! Brooklyn is finding many alternative ways, and its fun to try them all out. I encourage everyone to share their own food stories! Tell me all about it StellaBella Readers!